With the entry of fast acting Paint Booth Chemicals (coagulants/flocculants), the entire method of paint sludge removal has changed world-over. This has led to the elimination of large sized, open sludge pits/tanks and a drastic reduction in the water requirement of paint booths. In the conventional design, the paint booth chemical action time (hold time) for over-sprayed paint is substantial. This leads to voluminous sludge pit or booth tank water volumes. This also leads to heavy sludge blockade inside the paint booths. The whole focus has now changed to minimize the water quantity and to improve the water quality required for the paint booth system. In the new technology, the paint booth chemicals play a very important role. Paint booth chemicals are preferred much in order to reduce cleaning and maintenance costs by prolonging the life cycle of the water in the processes. Also, companies that give importance to paint application and try to avoid stopping of the production need these paint booth chemicals as consumables for the paint sludge removal systems that remove the paint sludge from the water automatically. The over-sprayed paint is mixed thoroughly with water & coagulant in the paint booths. This mixing converts it into a non-sticky homogenous slurry (without sludge flocculation). 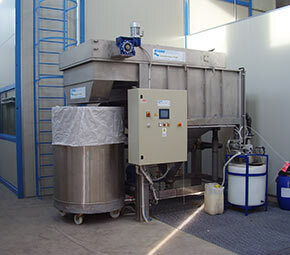 Special paint mixers can also be used for efficient mixing and flow of the slurry. The slurry is then passed through the Sludge Removal System, with in-line dosing of the Polyelectrolyte chemical. A special pipe mixer is used for thorough mixing of the polyelectrolyte. The paint sludge separates instantly and this floating sludge is removed continuously by the sludge removal system. Proper collection and mixing of the over-sprayed paint with the water & paint booth chemicals is the key to the success of this technology. The efficiency is enhanced with suitable paint booth design. Moreover, for down draft paint booths with civil tanks, the large sized sludge pits can be easily avoided or reduced in size substantially. The new technology can also be applied to exisiting paint booths as well as large sludge pits. Proper use of special mixing systems and proper system engineering makes this possible.